A new bungalow in an old Asheville, North Carolina, neighborhood combines 100-year-old styling with a recently rediscovered historic building material. 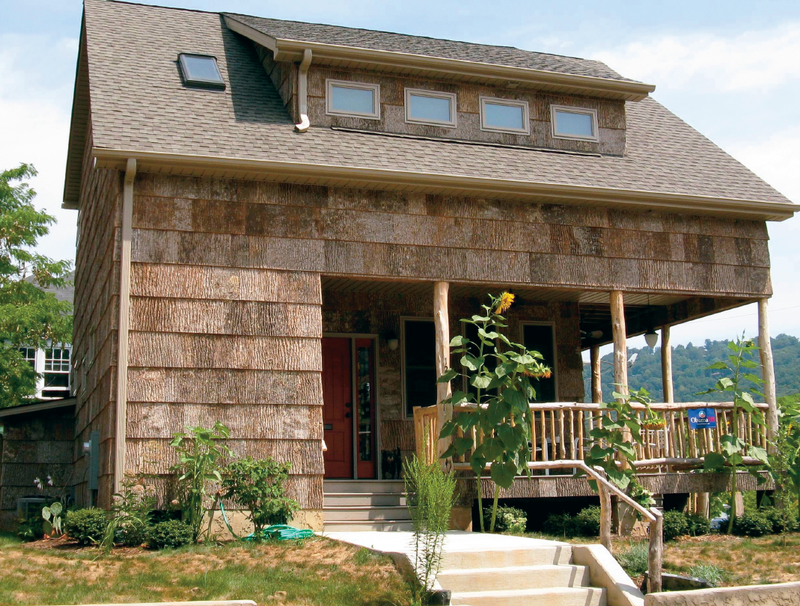 In 2007 I was writing two books—one on Asheville’s late-19th- and early- 20th-century architectural history, and the other on the reemergence of bark shingles as a sustainable, organic and sophisticated material for exterior siding—when my husband, Saul, and I had the chance to buy a small vacant lot near some of Asheville’s most significant Arts and Crafts landmarks. We leapt at the opportunity and have since built a compact bungalow that blends well with the style and scale of its urban surroundings and is clad in poplar bark shingles—an antique building material that has reemerged in modern form. History is all around us in the well-preserved remnants of this Gilded Age resort town. From the second-story side porch we have a view of the Grove Park Inn, the 1913 stone behemoth that remains a popular destination today, and we’re just a few blocks from The Manor Hotel, a fanciful tourist lodge that opened in 1899 and is still occupied, surrounded by dozens of handsome cottages, ranging in size up to 14 bedrooms and with as many as five sleeping porches, that were built on the lodge’s hilly 35 acres. Just a block away from us is the Chestnut Street Historic District, which contains some of the city’s finest residential workmanship and where the domestic servants who lived in our more modest neighborhood of small, workmanlike bungalows went to work each day. Although bark was a common building material for millenia for native peoples living amid North America’s virgin forests, it has occupied only a small niche in the evolution of American architecture since the arrival of European settlers. But during its modern heyday, from the mid-1890s through about 1920, bark-clad houses and lodges, definitely rustic but with a Craftsman influence, exhibited a high degree of inventiveness and finesse while composed of one of the most rugged materials imaginable. In the Southern Appalachian village of Linville, N.C., the classically influenced work of architect Henry Bacon, who was active in the area from 1895 to 1913 before going on to design the Lincoln Memorial in Washington, D.C., utilized shingles cut from two-inch-thick chestnut bark, which was available in abundance from trees being harvested for lumber and tanbark. Bacon’s unique contribution was to clad the exteriors (and, in some cases, the interiors) of his large, elegant homes in precisely squared shingles of chestnut bark. (A West Coast bark-house vogue sprang up a bit later, using cedar and redwood bark applied mostly in vertical strips. And after its formation in 1916, the expanding National Park Service strongly encouraged the use of bark for service buildings wherever appropriate, in keeping with its emphasis on using local materials.) Because I had lived near historic Linville, I knew firsthand about the durability of those shingles: a number of chestnut-bark structures there have been in continuous use for more than a century, unstained and unpainted. Old Linville bark-house styling died out with the ferocious chestnut blight of the early 20th century. Only in the last two decades have similarly tough shingles of poplar bark been available that meet modern building codes, particularly those governing fire resistance. We used the 18-inch-wide standard-grade shingles, although a more deeply ridged premium grade exists. Bits of clinging lichen, moss, and vine make every shingle unique. In time, the building as a whole may take on its own site-specific patina, especially along its northern exposure, where shade and moisture linger. To help our brand-new house fit in among its older neighbors, we took what style lessons we could from the bark house’s architectural heritage and from the Craftsman aesthetic—namely, that anything goes in the way of materials as long as they are handcrafted. And the more covered porches the better—preferably large ones. In our case, the lot’s tiny size—just 3,900 square feet—was both decisive and welcome. The house’s footprint is 30′ x 32′, with 1,444 heated square feet over two stories and the rest in covered porches or enclosed outdoor storage. Our relatively gadget-free lifestyle (no dishwasher, microwave or TV, and only a small under-the-counter refrigerator) freed us to devote substantial floor space and cubic footage to large closets and built-in bookshelves. First-floor front and center are a spacious dining room and kitchen, united beneath a ceiling of 4” tongue-and-groove pine planks that are stained and burnished to match the handsome oak cabinets, custom made by an Asheville master. A long bench and several small armchairs in the furniture mix are typical of the Appalachian “cabin style,” harking back to the old lifestyle of quiet pastimes around the communal table. A more formal sitting room, beyond the dining space, has its own bathroom and a separate entrance to the wraparound porch. It is thus easily converted to a self-standing en suite guest accommodation. 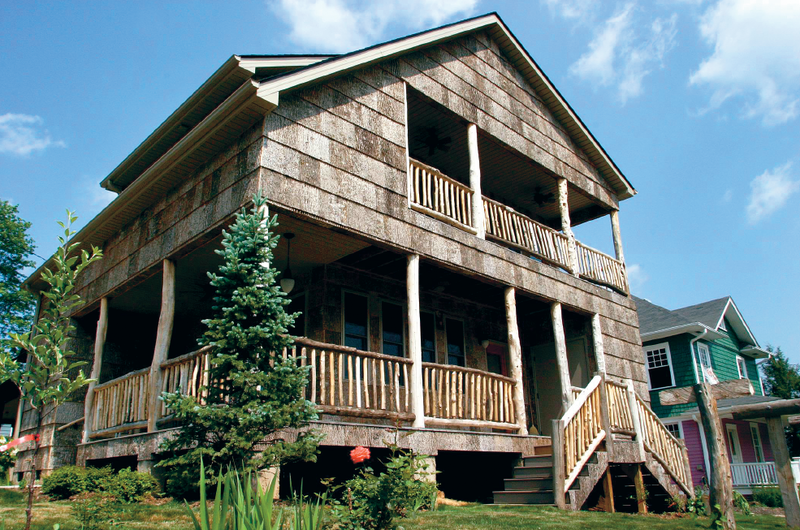 A master bedroom suite and an office are upstairs, both opening directly onto the long second-floor porch. 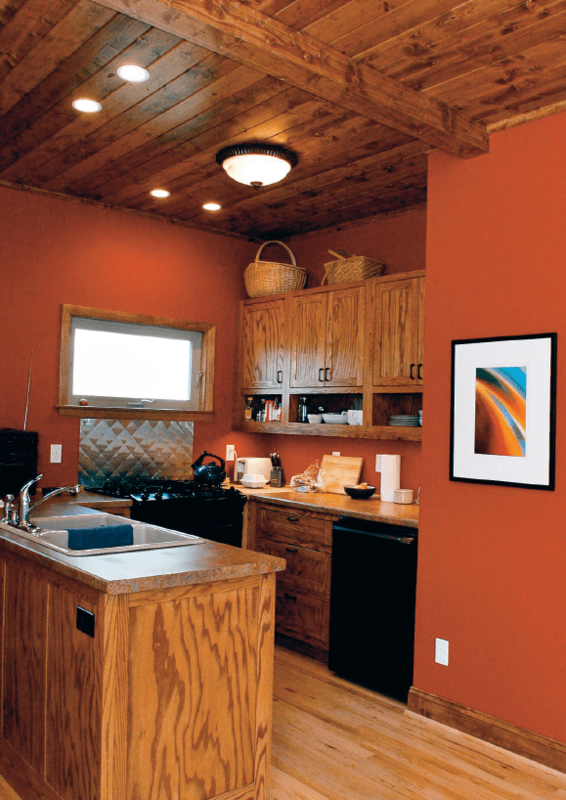 To highlight the wood’s qualities, interior surfaces like door and window trim, moldings and baseboards are stained rather than painted. (The molding design evolved from the carpenters’ hands, not from any catalog.) And painting the walls in rich earth tones like rust and taupe helped darken—and relax—the smaller rooms, actually making them seem larger by inviting in the lively street life outside the window. Including covered porches on both floors was a throwback to the pre–air-conditioning days when Asheville was a pleasant mountain retreat in the steamy South. 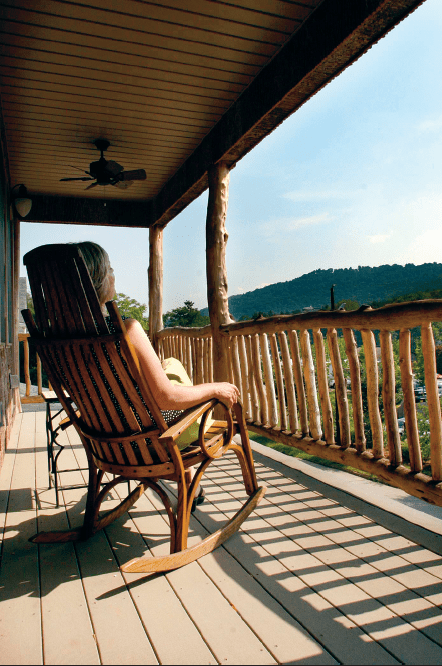 Although the house has conventional air conditioning, we don’t use it often; the porches work effectively to cool the air coming into the house, especially on our shadeless southeastern corner. Outside, we strived to create a surround for our rough-hewn house that subtly embraces it, with foundation plantings of low hollies, a few conifers to give winter color, space for “edible-landscape” plants like berries, fruit trees and grape vines, and a few touches of color from wildflowers of the Blue Ridge. Indeed, inside and out we tried to stay true to an authentic bungalow vision that weaves the house and its setting together, from the outermost edges of the lot to the innermost closet of the house. By the time construction was finished in early 2008, we had forgotten how unusual an all-bark house can look in the middle of a city, at least to someone coming upon it for the first time. We’re reminded of that every time a motorist or pedestrian slows down to stare—and smile. Nan K. Chase is the author of Asheville: A History (McFarland & Company, 2007), and co-author, with Chris McCurry, of Bark House Style: Sustainable Designs from Nature (Gibbs Smith, 2008). Her book Edible Landscape will be published in 2010.